Endangered Shorebirds? Blame Climate Change! From the “Blame it on global warming” Dept! Prof Tamás Székely of the Milner Centre for Evolution at the University of Bath, UK, described the findings as "alarming". For critically endangered species such as the spoonbill sandpiper, this could be "the last nail in the coffin", he said. 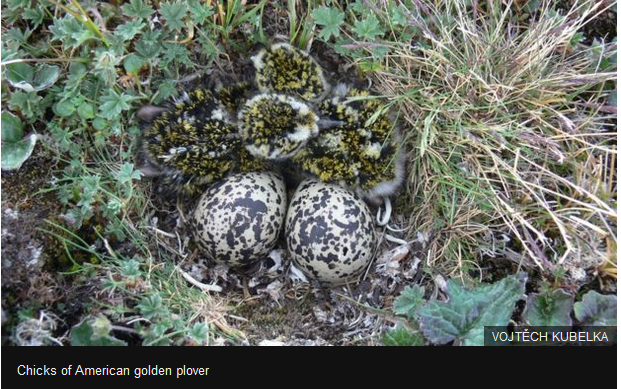 "We’re seeing the sad implication of climate change," Prof Székely told BBC News, "because our data show that the impact of climate change is involved, driving increased nest predation among these shorebirds – sandpipers, plovers and the likes." 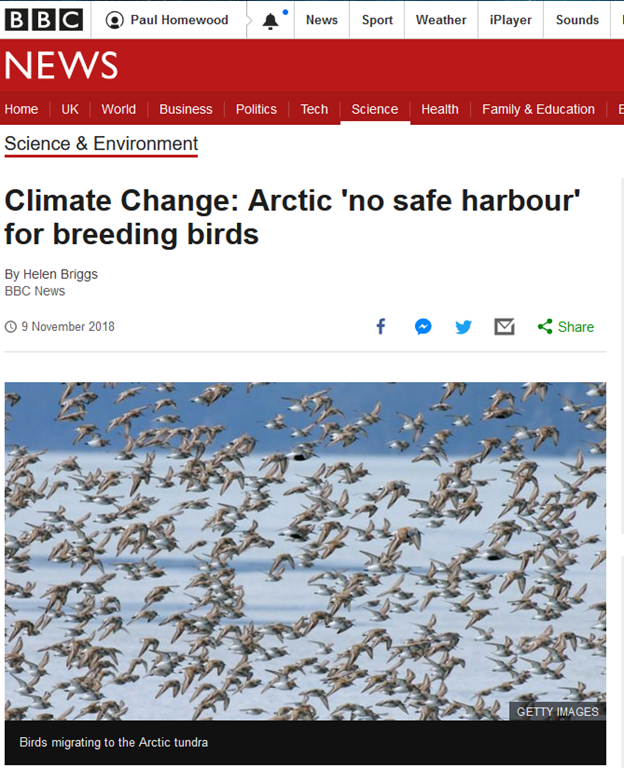 Dr Vojtěch Kubelka of the Charles University in Prague, Czech Republic, and a co-researcher on the study said: "The Arctic, with recently elevated rates of nest predation, is no longer a safe harbour for breeding birds. On the contrary, the Arctic now represents an extensive ecological trap for migrating shorebirds from a nest predation perspective." I’m always puzzled by these studies claiming that a warmer Arctic is responsible for species dying out, and such like. All of these birds have been around for a very long time, during much of which the Arctic has been much warmer than now. Yet they somehow managed to thrive then. In other word, they have no evidence that climate change is a factor, or how it would work. But where global warming is concerned, who needs actual evidence? According to the Cornell Lab of Ornithlology, the Spoonbill Sandpiper breeds in northern Siberia, mainly on the Chukchi Peninsula. They then migrate down the Pacific coast of Russia, Japan, North and South Korea, and China to their main wintering grounds in Southeast Asia. Most researchers believe that two factors are responsible for the Spoon-billed Sandpipers population decline: the elimination of migratory stopover habitat, particularly in the Yellow Sea region, and subsistence hunting on the wintering grounds. The Spoon-billed Sandpiper is one of many long-distance migrant shorebirds whose populations depend on intertidal habitats to fuel their migrations. In the Yellow Sea, large-scale reclamation projects are draining intertidal areas to convert them to other uses, particularly in rapidly developing countries like China and South Korea. The Saemangeum, the largest seawall in the world, eliminated one of the Yellow Sea’s most important shorebird refueling habitats. 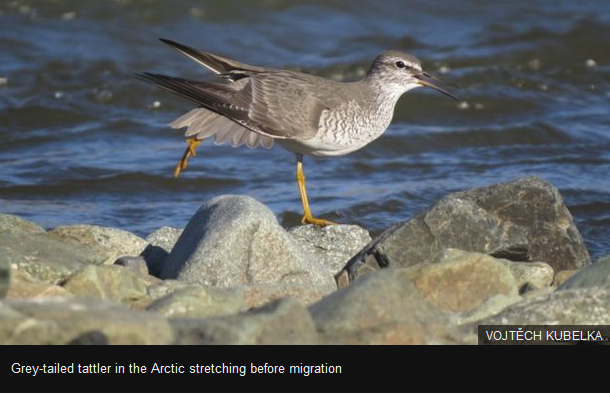 It typically hosted a half-million migrating shorebirds negotiating their 15,000-mile round trip journeys between the Southern Hemisphere and arctic Alaska and Russia. The Spoon-billed Sandpiper is the first of these species to be pushed to the brink of extinction, but others like the Great Knot may follow if additional development continues as planned. At least half the world’s remaining population of Spoon-billed Sandpipers winters in Myanmar‘s Bay of Martaban, where subsistence hunting with nets is a common activity. These nets routinely capture and kill Spoon-billed Sandpipers. Hunting, carried out by the poorest of Myanmar’s people, is now considered to be the greatest immediate threat to the species. Naturally the BBC are reluctant to blame those poor Burmese people for the bird’s likely extinction. This bird breeds in northern Canada and Alaska, then migrates down to S America. Market hunting in 19th and early 20th centuries caused major decline in American Golden-Plover numbers. One estimate of a single day’s kill near New Orleans was 48,000. Population rebounded after hunting ended. The bird is not currently regarded as being endangered, despite the decline in numbers. This little fellow also breeds in Siberia, before migrating to Australia, following the same route as the Spoonbill Sandpiper, down the coast of China, then via Indonesia and New Guinea. The grey-tailed tattler is not considered to be globally threatened due to its extremely large range and stable global population . This species is, however, recognised as threatened in the state of Victoria in Australia, but despite this no direct conservation efforts have been decided . Quite why they are threatened in Victoria is a mystery, but they are evidently doing fine elsewhere. Perhaps they are a Melbourne delicacy? However, as was mentioned above, the “flyway” from Siberia down the coast of China hosts a half-million migrating shorebirds. Large scale reclamation projects in the Yellow Sea can destroy vital refuelling points in intertidal areas, which are so important for the birds. Factors like this and general habitat degeneration are far more likely to endanger shorebirds than any changes in the Arctic. As for the “increased nest predation”, supposedly observed, if there are less birds returning to breed, there will be more competition amongst predators for the eggs that remain.